« I Expected More From You. Hey, Landon Donovan. Get Out of My Kitchen. I’ve mentioned before that our house backs up to one of the town’s best parks. This helps make up for the fact that our backyard is a very small fenced-in strip of grass that basically, at this point, belongs to the dog. So, if my kids can navigate their way past a few land mines, paradise awaits beyond. The boys love the little door from the “yard” that leads to a brick-lined, tree canopied path out to a big open field. In the mind of a five-year old, it’s fantasy-land magical. They emerge from that path and run full-speed-ahead across the long field and down a small hill to the playground, often meeting young friends at the other end. 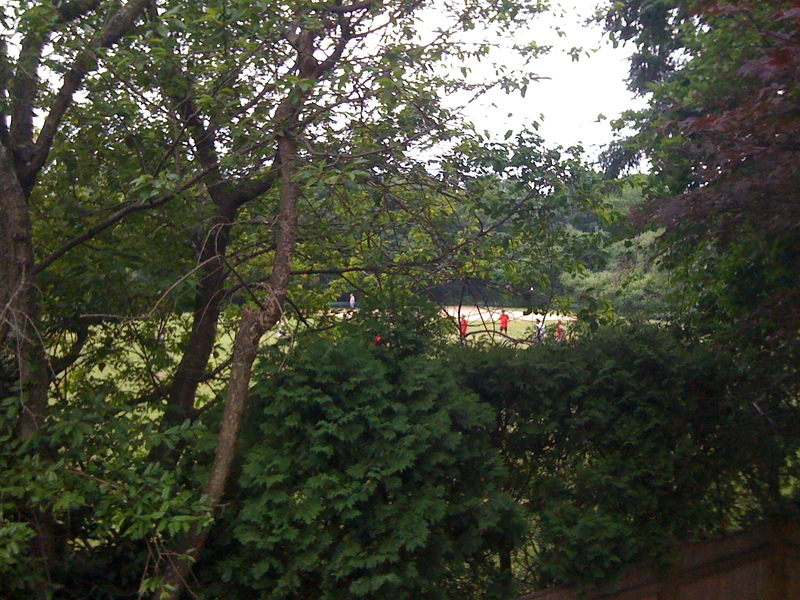 So, when we bought the house, we knew we’d hear the sounds of children playing on the fields. In the winter, the field is littered with snowmen and snow angels. In the warmer months, we hear softball practice, t-ball, peewee soccer and little league. Usually, I like the sounds. Happy children? Course. But, you know what I didn’t plan on hearing? The 40 and over Men’s Soccer League. At 7:00 pm. Nightly. These idiots are out there hooting and hollering and kicking errant balls hard against our fence. Then, they retrieve them from the bushes that line the fence, cracking branches and swearing like sailors. It seriously sounds like they’re in my kitchen, sharing a bowl of Spaghettios with my two-year old. So, next time we’re cleaning up Bernie excrement from our yard? We’re planning to give it just a gentle toss over the top of the fence. And the next time they’re back there fishing for a ball, killing our trees and corrupting our children one f-bomb at a time? Oh, yeah. Being that close to a park? That is dangerous for sure. I thought you were going to say the sounds of screaming kids who don’t want to leave was the worst. And, “spllllushhhh”…that’s LB’s favorite word. I think it’s the same one b/c I spell it “sploosh.” Plan to sneak it into a picture book. That is, if I ever come up with a complete story! What you’re planning on doing is completely immoral and wrong. So after you’re done, can you come over to my neighborhood and take care of the guy who circles the block in his dune buggy?